Lord Sai Baba is compassionate incarnate. He takes care of all and He has melting heart which always crave of His kids welfare. Following is such an experience of a devotee from Malaysia. Anonymous Devotee from Malaysia says: Sai Ram ji, My request is to keep all details confidential. My humble pranams on Your lotus feet, my dearest father Sainath ji. This is a continuation from the post: Thank You Dear Father Sai - Anonymous Sai Devotee. First and foremost, I apologies for the delay again. My son had check up last 24th May. And MY FATHER has answered my prayers again. I have no words to express how happy I am. My son’s follow up check up was scheduled on 24th May. Months before check up, I gave up eating some of my favorite food in the name of Baba e.g. rice, anchovies, chicken and mutton. I must admit, there were times (1 or 2 times) I had to breach my promise to Baba due to reasons I couldn’t avoid. I asked forgiveness from Baba. I didn’t do it on purpose. I had only one thing in my mind. I must get good news from the doctor during the checkup. My heart was beating faster and faster as the check up date drew nearer and nearer. A few days before the checkup, I began to feel restless. I know my husband too felt the same, but we just couldn’t bring ourselves to discuss about it, as we know what the result will be. So there was just silence between us. Finally on Saturday (21/5), I was restless beyond words. Although I had complete faith in My Father, the feeling of “scared” began to wrap me from the inside. Suddenly, I was talking to Baba in my heart “Appa, You know I am feeling so scared. I am begging for Your mercy. I don’t know what I should do to gain Your mercy, Appa. Since You love lighting lights so much, I will go to the Murugan temple here, go up the stairs (200+ steps) on my knees while lighting camphor on each and every stairs”. It was just an overnight decision. I didn’t fast or anything. It was just out of love for my Father. The next day, I did as planned. To my utter surprise, I got full blessings from My Father and also Lord Muruga. After making archana and all, I prostrated in front of Lord Muruga again and was asking Him, “Appa, I lighted the lights for You on the stairs. I hope You liked it. I am going to leave now, but I still haven’t gotten any assurance from You that You heard my prayers”. Just as I was closing my eyes, an old man, came and put Vibuthi on my forehead with His palm. I was shocked and beyond words. He was the priest’s assistance there. He told me, I saw you just now kneeling up the stairs. I know you are in some difficult situation. He then brought us aside and was asking our problem. I began to narrate my son’s story and what I did just now was for my beloved son. He then told us, about his eye problem and how it was slowly cured. He also asked me who my favorite god is. I told him Shirdi Baba and he also shared stories on My Father, Shirdi Sai Baba. Before, we left, he gave my husband a coconut and asked him to break it in front of Lord Muruga before leaving and gave assurance that my son is going to be fine. I was happy and feeling much better. We then broke the coconut and turned to leave. You won’t believe this. As we turned to leave I heard my favorite Baba song being played so loudly in one of the souvenir shops there. The most amazing part is I didn’t hear the song when we were there and doing prayers and all. Only after we broke the coconut and when we turned to leave, we suddenly heard the song. This is the first time; I heard Baba song being played in that temple. And off all songs, why that particular song was played? Furthermore, it was my all time favorite song. It is all Baba’s Leela. Then finally the day came. Upon the doctor checking my son’s eye (he’s now 8 months old). Doctor confirmed that the eye pressure is normal now. And the power of the eye which was 450 all this while has now tremendously reduced to 250. With this amazing miracle, I truly believe my son’s left eye will be normal in time to come. Baba has been answering my prayers and has given me assurance in many forms that my son is a healthy boy. I bow over and over again unto Your feet my dearest Father. I would like to take this opportunity to express my utmost humble appreciation to Veena Amma and Ashok uncle for their never ending love and support for praying for my son’s well being. And how can I ever forget the constant support and encouragement from my brother and sister; Malini and Venkat ji. I will not be where I am now without these beautiful people in my life. Dear Father, please continue to bless and shower Your grace and mercy upon all the kids/babies in the world who are going through hard time. They are innocent and let them all be healthy and happy and a normal life. Please Baba, I am begging you. 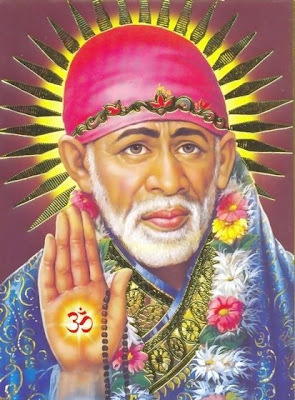 OM SAI RAM..........i read your previous experience few mins ago and now i read the next one...........may baba bless you and your baby...........its just happy ending..
Great experience!! !Baba always be with your children-guide them and put them on the right path.Always show your presence and also make us to realise the same. I pray God to bless your son with a very good health. May Sai Ram Bless You !! Its truly a wonderful experience. Throughout I had tears in my eyes. During such times our faith in our beloved Baba is tested and at the same time strengthened. Wishing all the best for ur son and may Baba keep him healthy always. I have just loved this experience of urs , so thank you for posting this.It just proves Baba will always come running when we call out from our heart.Baba bless u . You really faced hard time I can understand sister. Baba Please bless all kids and all people happy and healthy life Baba. Please make them to follow your path and please bless all of us Baba. sorry for such a big request Baba. We Love Youu so much Baba because you are our father Baba. Please excuse me and please give me a good job Baba. I surrender myself to you Baba. Please take care of me and my family Baba. I bow to your feet Baba. Wonderful experience indeed ! I have a child who has a chronic problem, she is 19 yrs old, I completely understand the pain you as parents go thru. With Baba's grace my child her life as any normal child given her condition. Your son definitely will be get back to normalcy with the FATHER'S GRACE on the little and innocent soul. Also I must thank you for praying for all the kids in the world who suffer with some health issue, it touched my heart and my eye filled with tears. MY DEAR LORD SAI, PLEASE BLESS THIS BABY AND EVERYONE OF YOUR DEVOTEES. Omsairam omsairam omsairam omsairam omsairam omsairam omsairam omsairam.please bless everyone with good health. Oh Sai Ram i have no words to explain the happiness i feel today 14/12/11 bcoz u made my dreams come true.Yes after a long term of struggle in our life ur entry in our life has bought lot of changes. all the wind storm that crossed our life has settle after praying u seeing u coming to ur temple baba. Yes we got Australia visa only bcoz of ur blessing to us. thannking u soooooo musch BABA. " FOR ALL BABA IS THERE TO HELP AND FULLFIL OUR NEED IN THIS WORLD". IAM soo excited toady bcoz of baba..
Baba, I love you so much.. I don't want to say any word now. really my eyes are filled with tears while reading this experience. You shows so much affection towards all devotees without failing..who can do this for us..
3 weeks back, I decided, I want to hurt Baba bcoz I'm facing problems and thought that he is not listening to my prayers. As sai is against to fasting, myself decided to do fasting on thursday..But I forgotten totally, before thursday, it remembered by Baba. Why he chosen like that. As I'm doing the job, decided to do the fasting from morning to evening upto 4pm. Then in office at 3pm, I said to my colleague ,after 4pm we can go to the canteen. But I knew, in canteen we didn't find any food items.So I'm thinking abt that. My job in customer place.myself & my colleague only there at customer place behalf of my company.Then At 3:50pm, customers are going to celebrate Birthday party of an employee. They arranged everything. They are going to offer Cake,mixture & a soft drink. Myself thought that its all arranged by Baba. Then we asked them whose birthday it is to greet that person. They told us Sai Krishna Birthday. I really wondered when I listen that name. Actually I don't know his name till date, as he is a new employee there.Really see Baba, how much affection, he is having for me. Then exactly they celebrated it at 4pm. He didn't want to make his devotee to be Hungry. Then my colleague said to me, now the time is 4pm, then I told her, see How Baba arranged everything for me. Then After 1 week, I felt some what ill..thinking abt my fasting..hw can I do it..On Sunday, without thinking any thing I opened Sai satcharitra, there he is saying don't do fasting, it is dangerous to your health. When writing this sentence at present, Baba Song came in my Mobile..I won't lost you Baba.. I want you, please be with me & with all of us. Please forgive me, If I have done any mistakes...I luv u sai, luv u so much..